This guide will discuss how to maintain your Police Force effectively, efficiently whilst simultaneously raising your Bank Account. This Guide does include mid-game and late game spoilers so beware. The objective of This is The Police is to accumulate $500,000 by the end of 180 days - this is a long and difficult process, so hopefully this guide will be able to help you reach that objective. You're about to play This is The Police (TTP) for the first time; you're ready to take on any calls and challenges on your first day and you use every available officer for some petty crime, only to realise that you have a robbery going on as well - you lose respect from your officers and City Hall so you've got no choice but to restart, but what do you do? At the beginning of the game, your starting officers will be terrible - they'll screw up basic calls, request backup on simple tasks and die super easily. Their levels will range from 20 - 300 (ish) and a few curve balls of 700+. Fortunately, your officers will gain experience on every call they respond to perfectly (and only perfectly), that means: No Casualites (Civilian or Officer) and no escapes. If this is done correctly, each officer will gain +10 experience (+5 if they were called through backup). The more succesfull calls they go to, the better officer and more experience they'll have. You are going to want your officers at the 300-600 xp mark as soon as possible to ensure your Police Force is as effective as possible. This means you are going to have to use your officers wisely when responding to calls, and ensure that they are all used each day. Don't just send one officer out all of the time - you can maximise the xp gain by sending low-experienced officers to easy situations with high-experience officers to ensure a good flow of experience. Beware: as stated previously, your officers will die extremely easily - so make sure when sending officers to a call, that they have the appropriate amount of experience per call. If you send a couple low-experienced officers to a tough call they will all die and your other officers and City Hall will not be happy with you. Once you've gained your footing and learnt how your officers' leveling works and how to respond to calls, you'll notice that some calls you're responding to are fake / mislead. This requires you to read each call's information carefully and see which calls are fake and which ones are real. Don't blindly send your officers to every call, as some fake calls will be seen as extremely dangerous (such as bomb threats), and ask you to send every officer, as well as a Swat Team. If you do this, not only do you waste time, but you lose possible experience gained from sending your officers to other calls. Responding to fake calls with every officer will paralyse you for a good few minutes. So ensure you read these as carefully as possible. 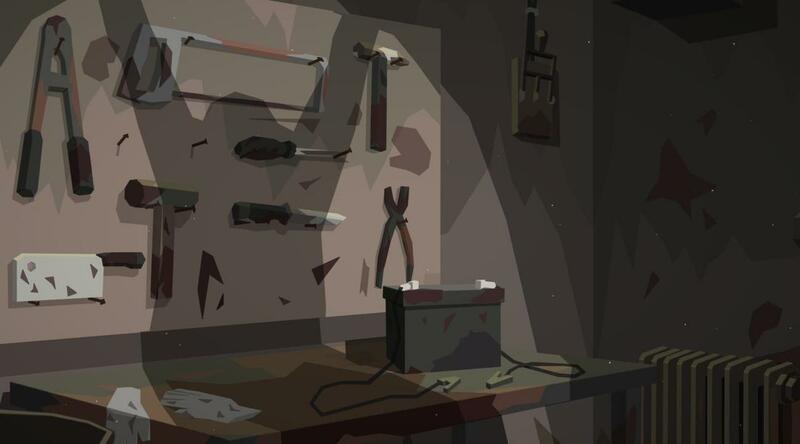 Fake calls in the mid-game: Once you have come across the serial killer, "The Dentist", you will be harrassed with constant fake calls about people seeing other people with a drill. Upon the public release of the serial killer and what he does, you will receive about 10 fake calls in one day about people freaking out - so ensure you read every call carefully. 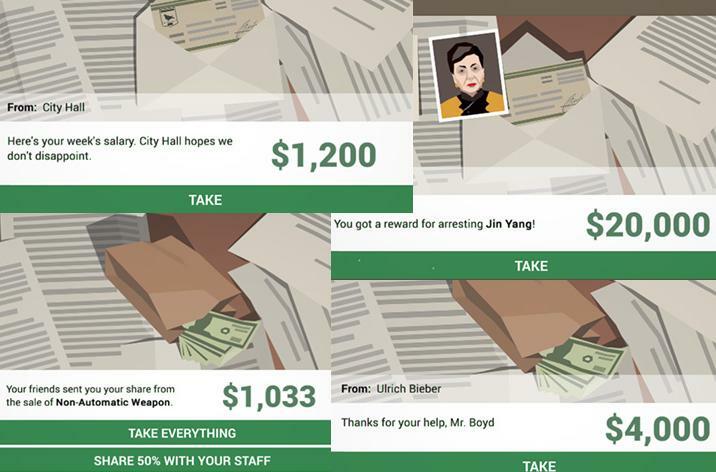 City Hall (mostly the Mayor) is a big role in this game as he will dictate how much money you get, how many officers and detectives you have as well as some other things. As much as you hate City Hall and the mayor, you have to abide by his absurd requests if you want to have a comfortable experience. Some requests include: Firing all black officers, beating up gay people in a parade, beating up war veterans etc. Clearly these are ridiculous terms, but if you want your paycheck and a good size police force, then you're going to want to answer some of these. At the beginning of the game, the Mayor will ask you to 'Fire All Black Officers', but you'll see that one of your best officers is black (he'll have around 800-1200 experience). Obviously you don't want to fire him, or any of your other officers. So you can ignore this request if you want to - I did. There isn't any major repercussions for not following this order, except for City Hall not liking you for a bit. You don't always have to send officers to City Hall's requests. Occasionaly during the day, City Hall will ask for a number of officers to do something for the Mayor. This can range from judging a Hot-Dog eating competition to protecting the Mayor whilst he goes for a walk. Note that if you answer this and send the (will most likely be 2) officers, you will lose those officers for that day and cannot use them until their next shift. The Mayor is a ♥♥♥, but he's your boss. Every 5 days, you'll be able to request something from city hall, these include: A pay rise, improvements to your SWAT Team, An additional officer slot, and an additional detective slot. If you have a poor reputation with City Hall, then they will deny these requests every time (and occasionally cut your budget, meaning you'll have to fire officers - sometimes illegaly). But if you keep a good standing with the Mayor, you'll be able to have one or more requests accepted at the same time. By the mid game I was able to request one of everything and got accepted every time as long as I kept a great standing with the Mayor. The Mafia, like city hall, play a major role into your game. In a few ways they are like city hall, except you can gain more profit from associating with the Mafia. Once you've gained a good enough reputation with the Mafia, you'll be able to requests favours from them (for a price), and these can help a great deal especially mid-game for reasons I will get to later. In the early game (I think - I'm basing this on memory), you will have to decide between two different mafia gangs - the Sands or the Vargas. Each will provide with the same benefits, but with a big difference. There will be a gang war that will occur and will go for around 1-2 weeks. This period will take a lot out of you as if you want to support your Mafia, you'll have to send officers to the locations marked to side with or against the mafia of your choosing. If you want the easy way, then side with the Sands. You are probably more comfortable with the Sands as they are one of your first contacts in the game; whereas, the Vargas are new and looking for a hostile takeover. Siding with the Sands is easier, as you can complete as many calls from them as possible and help them win the Gang War. Vargas, however, is much more frustrating as you must keep a balance between the two gangs in their wins and losses (which are counted at the end of each day). If the Vargas are too far ahead 3 days in a row, the Sands will figure it out and kill you in the middle of the night, resulting in a game over. So choose the Sands. Future benefit for siding with the Sands: You'll be able to take down their gang later on, earning you a nice $200,000. This is a long process, but it's definitely worth it. Now that you're experienced with the game and are at around day 70-120, you'll notice the difficulty drastically increase with all of the new calls incoming. As well as having new associates and perhaps you're not earning as much money as you thought you could be. The Mafia: If you are still cooperating with the Mafia, you will be able to sell your goods to the mafia and they will give you a percentage back. Say you send your officers to take down a drug lab - if done succesfully you will have drugs such as Heroin in your possession. You can take these to the Mafia to sell for a price. You will receive your money the next day. The amount of cash you get from these items depend on the items themselves, and can have a rather large range. You can sell a ficus plant for $5; or sell an assortment of automatic rifles for $15,000. It all varies on the goods you take. But be careful, as you will lose some of your reputation with City Hall if you do this everytime this option comes up, so be sure to take some items back to the Police Department. Furthermore, once you get the money from the Mafia, you have an option to share 50% with your staff - this is useful to keep a good standing with your staff members so they won't file reports against you (Will go into detail about this soon). Solving Crimes: Solving crimes can be a tedious task, but can also provide you with a nice bonus in your wallet. Plus it's good to see that you don't have investigations pending. These investigations can give you a few thousand dollars each, and provide some decent experience points for your detectives. This isn't the best method to get money, but it's practical and legal enough. Taking Down Gangs: This is by far the most effective method of gaining a decent amount of money. Although it does take time to take down a gang, the pay off is great. *Mid-Game Spoilers coming up* You can take down the Sands (if you side with them) through a rather long string of informants. Taking down their leader (Christopher Sands) will give you a fat paycheck of $200,000. Which will boost your money up to the $300,000 - $400,000 mark. The best part is that this is not the only gang you can take down - there are multiple gangs that are waiting to be destroyed. The payout will range from the size of the gang and their notoriety. The easiest gangs to take down (which will have about 2-3 informants, and 1 gang leader) will grant between $40,000 and $70,000 each. Random Calls: The Mid-Game is also the best time to be taking on random calls for money from clients and customers. This will require you sending your officers to these calls. A lot of which are highly beneficial in more than just a financial standpoint. Some will grant your officers +100 experience, a better reputation with your Officers etc. Of course, some of these can do the opposite: You can lose your officers for the rest of the day, your officers can quit and your officers can die (only from one I've seen). In the mid to late game, you'll be called by some medical clinic to test a new virus on 4 officers. From my playthrough only one of my officers died, and the other 3 were fine. I also got $80,000 from this one call alone. So this is definitely recommended to take. Smart Spending: Make sure that when you do spend money, that it's a wise investment. Using money through your associates is where the majority of your cash will go. This includes correcting mistakes, hiring new officers legally, firing officers legally, managing accounts, and many other things. Never use the private investigator to help you solve Investigations. $80,000 (I think) for a private detective is not worth it; if you're struggling with the investigations, just look it up on YouTube. Never purchase anything through the Church. It's useless and does absolutely nothing. The Price Range will be between $2,000 - $15,000 for absolutely nothing. As much as "praying for your officers" sounds cool, it's not. Avoid the Church at all costs - thankfully you can take down the church later on for Drug Trafficking and Production. (Which will give you a good $80,000 I think). You will gain and lose many associates throughout your playthrough. They can provide some decent benefits to help you be as comfortable and untouchable as possible. At this point you may have already been audited for poor performance, or been exposed by your officers for corruption. There are many ways to deal with these problems, but the most effective are through your associates. Your most useful associate is your Deputy, as he can arrange multiple things for you, as well as allowing you to hire a snitch. The snitch will give you valuable information for a weekly fee of $500. Your snitch will show you your relationship between your staff, as well as show which officers are going to testify against you in court (which could end your game if you do nothing about this). You can also buy the silence of your officers so they do not proceed with the court hearing. This option is the easiest way to handle this and is quite costly at $12,000. Another great associate is Atticus Corporation. This will allow you to hire and fire your police officers at will for a small fee (around $1,200). As well as giving you access to a special bank account that will not have any penalties or fines charged to it. This bank account is very useful if you're being audited for poor performance as they will deduct 25% of your cash from your bank account for damages. (In my first playthrough I did not pay attention to the audit and lost around $150,000 - so I replayed that day and put my money into the secret bank account and only lost around $20,000). My favourite use of Atticus Corporation is the calls you get from them, as well as the easy firing method. Some of the calls you receive require you to send 1-4 police officers to their building for one reason or another. Your officers won't get hurt and it's almost always an easy $6,000. The easy firing method allows you to get rid of officers you don't want anymore by making them think they're getting a new job offer at Atticus Corp. so they quit the police force. (When in reality Atticus will fire them for a legal reason, effecitvely leaving the person jobless without any harm to you). This is very useful when one of your officers, Roy, threatens to expose you if you don't re-hire him again. (For some reason he bribes you $15,000 to accept him because the blackmail isn't enough? oh well). So I accepted the $15,000, spent $1,200 to have him quit and had nothing to worry about after that. (Incase you're wondering, Roy is useless with 5 experience points so don't bother trying to level him up. At this stage in the game I had every officer over 400 experience and it was just an easy $13,800). If you've read everything above, it should provide an insight on how to get extremely wealthy mid-game. Which can leave you between $400,000 - $600,000 before the late-game even begins. At this stage, money isn't an issue and your Police Officers are well trained enough to handle any call you get. At this stage of the game (day 120 onwards), it's all about surviving. You should have enough money and enough decent officers to last the rest of the game. So unless you make really stupid mistakes, you should be fine. On one day in the late-game, you will receive an anonymous call to replace the fuel in your officers' cars with a special fuel. You will be given $12,000 and you'll never hear from this person again. I, stupidly and blindly, accepted this thinking nothing of it. It wasn't until a week later that the problems occur. Your officers will tell you about a strange sound coming from their car's engines. Then, after a few days you'll have the first "accident". Your officers will begin crashing on their way to calls and dying immediately. You'll then realise what a terrible mistake you've done. For the next few weeks to come, almost every day you will lose at least one officer thanks to this fuel. In one day, I lost 3 of my best officer (totalling to around 4000 experience points) thanks to them crashing their cars. These car crashes create a number of problems for you: you will most likely fail the call they were going to; you'll lose a great officer (most likely), and you'll have to hire new ones (who will probably be around 100-200 experience). At this stage you will have to do your best and pray that your best officer doesn't die. Furthermore, a lot of officers will stop going to work and skip it as it will be close to Christmas. So these days will be especially tough. Make smart decisions. Fire Officers. Kill Officers. Anything you have to do to get to day 180. That's your only objective: Surviving with money. The relationship between you and your officers isn't much anymore as they'll most likely wind up dead or fired within the week. However, if you're unfortunate enough to have an audit come in, or your officers try to expose you, then it becomes a problem. By this stage it's just easier to fire your officers. Or you can kill them off which may or may not create future problems for you. The late game is quite simplistic compared to the early and mid-game stages. You will practically be undoing everything you've worked to, as your only concern has been about the money the whole time. As heartbreaking as it was to see my favourite officer (who was there since the beginning of the game and had about 1200 experience) die in a car crash, I wasn't too sad as she was also plotting against me. By the end of the game you become an unecessary evil to survive.